Secrets of Screen Acting | The book. The podcast. Revolutionize your acting career. 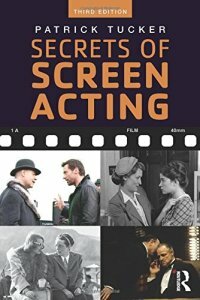 The paperback textbook of Secrets of Screen Acting, now in its third edition, is available here. The full-length unabridged audiobook version is available here. Tucker has created and developed several screen acting of a courses, and this book is an extension and explanation of a lifetime of work in the field. Containing over fifty acting exercises, this book leads the reader step-by-step through the elements of effective screen acting. After reading Secrets of Screen Acting, Los Angeles-based actor David H. Lawrence XVII had the temerity to call the book’s author, Patrick Tucker, at his home in London. Lawrence was fascinated with the book, but felt the constraints of the printed page left so much more to be said, and proposed a series of 5 minute audio interviews with Tucker, in the form of a podcast. “Beautiful. What’s a podcast?” queried Tucker. And so, one of the most fascinating global audio connections was made, between a US actor, and a British director, who provide a daily 5-minute devotional to the actor’s career and skill set. Work, auditions, on-set behavior, headshots, The Method, direction, editing, technical operation on set and more. Secrets of Screen Acting goes far beyond sense memory, prior moments and avoiding indication: it fundamentally changes the way a working actor approaches their career and executes their tasks. Want better audition results? Want to get called back to shows and work with directors repeatedly? Get Secrets of Screen Acting – the book and the episodes. Listen to some sample episodes, then get the whole set of nearly 300 episodes. Listen to a single episode once a day, let it sink in, and watch as your acting career blossoms. By the way, the full-length unabridged audiobook version of Secrets of Screen Acting, a completely different product from the podcast series, is available here. OK. You’re an actor, and everyone’s trying to sell you something. We get that. Right? Huh? Now, visit the complete archives and get them all. You can get Secrets of Screen Acting: The Podcast in the complete episode archive below, or you can get any of the ten-episode archives. I want them all, thank you very much. And I want them NOW. You can get Secrets of Screen Acting: The Podcast in ten-episode archives below, or you can get the complete episode archive. Once you receive your archive, double click on it’s icon to unzip the file. You can listen to these premium podcasts on your personal computer (Mac, PC or any computer with MP3 playing software installed), or any portable MP3 player or smartphone. Looking for the Secrets of Screen Acting Podcast? Due to the sunsetting of some of the technology we used to get the podcasts to you, the podcast subscription has been gently retired. But fear not. Neither David nor Patrick are easily silenced. New episodes are in production, and will be available in the form of individual ten-episode archives and in the complete episode archive. Want to share an acting success due in no small measure to your paying attention to a Secret, and implementing said Secret? Questions for David to ask Patrick on your behalf in an episode? Send David an email. Go ahead.